Over at Meljens Design the challenge is to have food somewhere on your project. I used her Candy cane image, after all, it's eatable, sweet and can be very sticky. The sketch is from Bugaboo's Catch the Bug challenge, where they celebrated World Kindness Day. At One Stitch at A Time they want you to use your favorite color, so just in case you can't tell what my favorite color is, it's RED, okay that's only one, you'll have to guess the other 2 some other time! Now that is one sweet card! Lovely Christmas card DQ I love the papers you have used. Thanks for playing along at OSAAT this week. 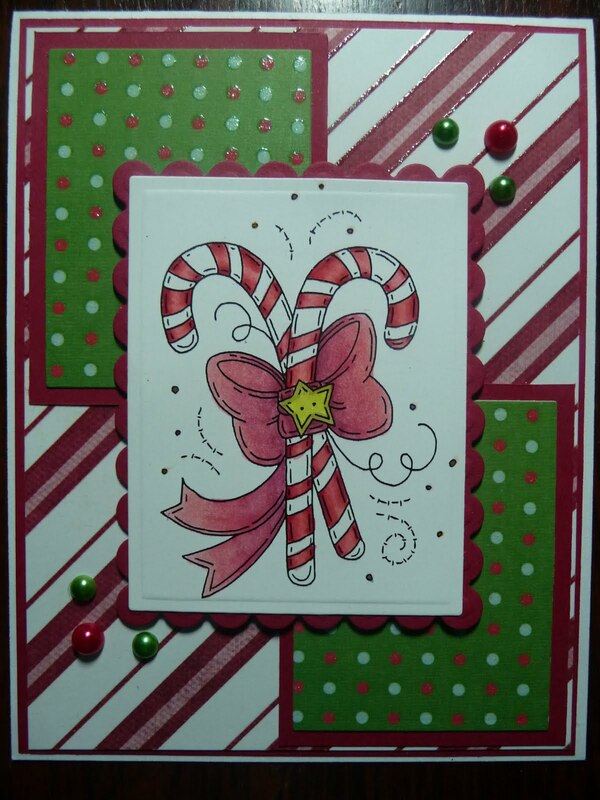 Very pretty card and I love how you've colored that image. Lovely papers too. Thanks for joining us at MelJen's Designs this week. Really fab card, love the LO & colours!! Thank You for joining us at OSAAT this week, good luck! Such a sweet image, and that designer paper is so perfect! Thanks so much for participating in Catch the Bug's World Kindness Day/sketch challenge with Bugaboo Stamps! :D MWAH! Beautiful card. I love this image and colours you used. Thanks for joning us at One Stitch At a Time this week and Good Luck. Lovely card - love the paper! Thanks so much for playin' along with us for the World Kindness Day challenge at The Catch The Bug Blog with Bugaboo Stamps! Great card! I love how you coordinated the background paper. Thanks so much for joining us this week at Meljen's Designs! Great coloring job! I love this layout! Thanks for playing in the Bugaboo Challenge with us!